Please share a little bit about your career as a coach, teacher and speaker? I've spent the last 32 years at Gallup as a strengths coach, and a teacher and speaker around the theory or strengths development. I love to coach people on their Clifton Strengths results so that they can aim their strengths at the outcomes that are important to them. I will be retiring soon from Gallup and anticipate doing similar work within my own business. Did you dream of writing from a young age? Had your explored writing before this book? That's an interesting question. The short answer is yes. My late husband and I wrote five-year goals shortly before he died and one of them was to co-author a book. 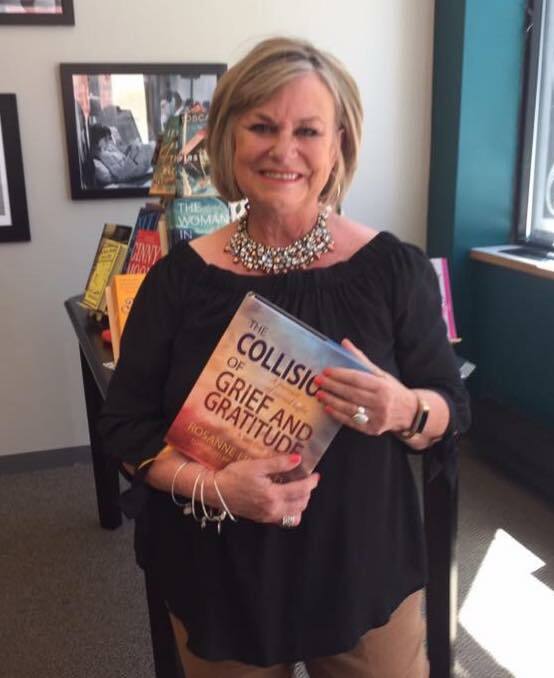 I know your journey to writing The Collision of Grief and Gratitude began with a single Facebook post on the day of your husband Curt's funeral. What led you to write that first post and what kept you writing a new post day after day for over a year? Honestly, I had a second wave of grief that came over me when I realized how many people had done things for me during the days following his death and yet, I could hardly remember them all, much less know how to tell them how much I appreciated them. At the same time, my son encouraged me to look at both my husband’s and my Facebook pages to see how many notes of condolence and support had been posted from all over the world. Those two things spurred the idea that perhaps I should write an entry thanking people for their support. After a few days of thanking people, I realized what power there was in the gratitude I was feeling. So, I chose to not just look for people to thank, but for any moment of gratitude in each day, no matter how difficult that day had been. How did you find something new to write about each day? Did you ever have days where you struggled to sit down at your computer and come up with a new thought to share? Honestly, I didn't find it hard to come up with things to share. Because I was determined to be authentic, I simply poured out my heart about what was going on in that day, both practically and emotionally. I didn't ever plan what I would write. I would simply sit down, put my fingers on the keyboard and start to write. As corny as it sounds, my heart just poured out on the keys. What brought you joy as you continued posting about your journey? What did you find difficult to face along the way? There was so much joy along the way. I often said that it was like having all this support every single day as I went through this horrible time of my life. There were times when I found it hard to express the reality of grief when I knew not everyone would want to read about it. However, I got to the point where I just needed to write. My son often said it was easier for him to drop me off at my house at night after I had spent time with his family, because he knew I would have those Facebook friends to be with me at the end of the day. I certainly never intended to make these posts into a book. I never intended to keep writing them for 366 days. I'm not sure I intended anything. It was totally something that happened without a plan, but clearly, became a part of my grief process. About half way into the writing, people started to suggest that I should keep the posts and put them into something permanent for others to read in the future. I had people close to me and people I didn't really know all that well reach out to me with compelling reasons for me to put the posts into a book. At the end, it was three different people who finally said things that really made me feel like it was something I needed to do. One person said, "this was the book you were meant to write, even though you didn't know it," referring to the fact that Curt and I were planning to write a book. That was powerful to me. You chose to include pictures in this book. How did you decide what pictures to use. Was it an emotional process to choose them? Yes, it was a very emotional process to choose them. (What a good question!!) I am a very visual person and aesthetics are important to me. My husband was a great photographer, and I felt like it was a way to honor him. I used his photographs to introduce every month, but I also used other photographs to make the posts personal just as I had done originally on Facebook. I debated about including pictures, as I knew it changed the tone of the book, but again, I wanted the book to remain true and authentic to the original nature of the posts and intention of my writing. What do you most hope readers will take away from your book? Oh, gosh, everything. 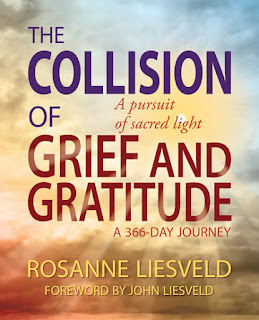 I think most people think this book is for people going through grief, and of course, it is. But I hope it is a book that is an inspiration for people to just take their life to the next level. So many people that commented on the posts were simply inspired to invest more in their marriages, their faith, their families, their relationships and their lives in general. That's why I now say the book is about living life with more intention and gratitude. What is coming up for you in the next few years? Will you be writing other books, creating a workshop based on this one or? 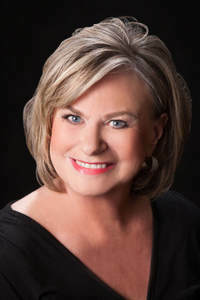 I am retiring soon and looking forward to having my own business where I can work with people on living that life with more intention, gratitude and with more of an eye on using their God-given strengths. I would love to write another book! Stay tuned! 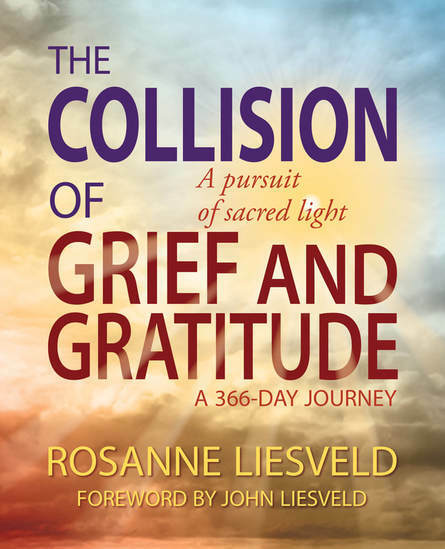 Rosanne is available to chat with groups or book clubs either in person or via Zoom. Contact her at roseliesveld@gmail.com.